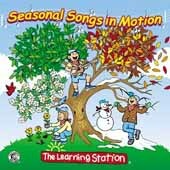 All four seasons come alive with this collection of 15 original and classic songs and activities. Row, Row Your Boat to a fun adventure, rock around the Mulberry Bush and bounce to a new London Bridges beat. Join us for this musical celebration of the seasons that will have you movin', groovin' singing and dancing. Also includes songs for Kwanzaa and Hanukah.